It was Lord Acton (1834–1902) who famously said, “Power tends to corrupt, and absolute power corrupts absolutely.” What’s often forgotten, however, is that Acton was describing the danger of papal absolutism, a danger David Kertzer chronicles in his outstanding new volume, The Pope Who Would Be King: The Exile of Pius IX and the Emergence of Modern Europe. Known for his Pulitzer Prize-winning biography of Pope Pius XI, The Pope and Mussolini, Kertzer has now captured the tension of the long 19th century, a critical time in European history when dynasties were falling like leaves. At the center of this tension was Pius IX (Pio Nono in Italian), the longest occupant of Peter’s Chair (1846–1878). A study in contradictions, Pius IX was initially hailed as a friend of constitutional government, but eventually proved to be an icon of dictatorial rigidity. He started his promising pontificate by liberating Jews from the indignity and squalor of the ghetto, where the church had consigned them since the 16th century, only to later reassert Rome’s anti-Semitic policies. He decreed the doctrine of papal infallibility while building a legacy of famously fallible decisions. A master storyteller, Kertzer combines academic rigor with lively prose, transporting readers to a time and place when life was both predictable and yet ripe for dramatic change. Random House (2018). 512 pp. $35.00. David Kertzer is one of the world’s foremost experts on the history of Italy and the Vatican, and has a rare ability to bring history vividly to life. 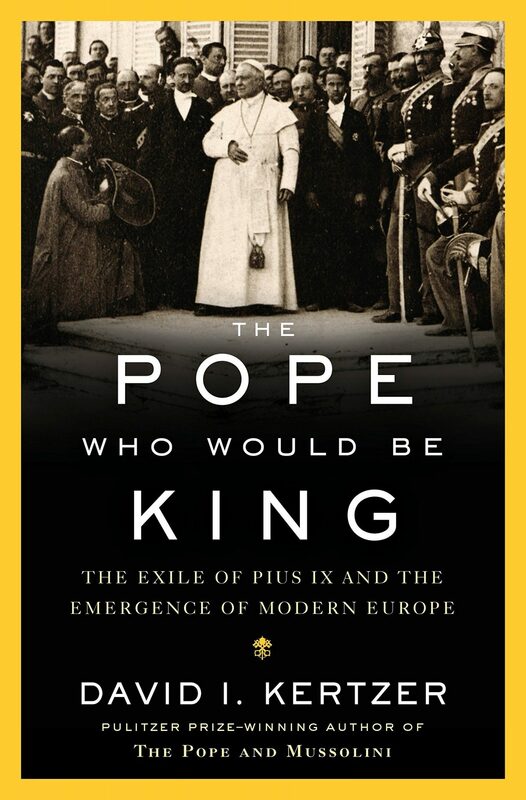 With a combination of gripping, cinematic storytelling, and keen historical analysis rooted in an unprecedented richness of archival sources, The Pope Who Would Be King sheds fascinating new light on the end of rule by divine right in the West and the emergence of modern Europe. For more than a thousand years, popes ruled as princes over the Papal States, leading armies and expansive territories that they governed as semi-secular sovereigns. Although Rome was its capital, the church’s temporal domain reached as far north as Bologna, Ferrara, and Ravenna. Within the Papal States, priests were free to enter any home in their parish to search for illicit behavior. If a family ignored church precepts, police would be ordered to make arrests and send offenders to jail to await sentencing. Courts were ruled by priests, and a priest’s testimony and verdict were the final word. Giovanni Mastai Ferretti was born into this world in 1792 in a family of minor nobility in Senigallia, a town in the center of the Papal States. Despite his epileptic seizures during childhood, which threatened his mother’s ambitions for her son’s priestly vocation, Mastai was granted a special dispensation to be ordained. In 1827, at age 35, he was named archbishop of Spoleto, the town in which Peter Martyr Vermigli had effectively brought church reform three centuries earlier. Such reform was once again needed, not only in Spoleto but throughout the peninsula. Unfortunately, it didn’t come. Instead, revolts against papal government erupted in 1831, sending Mastai to find refuge in the kingdom of Naples. It was a harbinger of what lay ahead. This book is for anyone seeking to understand how the Roman Catholic Church’s struggle with modernity shaped the theology and place of the church in the liberal democratic West—a process that continues today. When Mastai was elected to the papacy and took the name Pope Pius IX in 1846, many of his 3 million restive subjects lauded his ascent, hopeful that the obliging archbishop of Spoleto would move the Papal States toward more democratic ideals. But, as Kertzer points out, “He was a man with benevolent instincts and deep faith but woefully limited ability to understand the larger forces that were transforming the world,” and, following from these limitations, “he would be the last of the pope-kings, a dual role central to church doctrine and a pillar of Europe’s political order for a thousand years” (3). Only two years after Pius IX ascended to the Peter’s Throne, the political ground began to shift throughout Europe. In 1848, these reformist tremors also shook the Italian peninsula, as nationalists coalesced in the so-called Risorgimento. Men such as Giuseppe Mazzini, Carlo Armellini, and Aurelio Saffi—not to mention the steely-eyed military commander, Giuseppe Garibaldi (who was so highly esteemed that Abraham Lincoln sought to recruit him to lead Union forces in the U.S. Civil War)—were initially encouraged by the possibility of democratic reform under the pontificate of Pius IX. And they had good reason to be. Pius IX’s first official act was to release political prisoners, followed by provisional plans to revise the constitution and introduce new technology such as railroads and telegraph lines. But the reformers’ hope of progress rapidly translated into demands for revolution. “After centuries of oppression,” Kertzer writes, “the people were at last rising up to assert their rights” (112). The Roman theocracy that had existed since the eighth century—in which the pope reigned, cardinals occupied the highest positions, prelates lived in extravagant palaces, and priests exercised temporal authority through an intricate network of spies and informants—was about to end. A new representative government would usurp the old political order. On November 15, 1848, the conservative minister of Pius IX’s government, Count Pellegrino Rossi, was assassinated. It was a shock that knocked Pius IX off his feet and set in motion a series of events that would lead to his exile from Rome. In short order, he would flee his Quirinal Palace, removing his red papal berretto and Moroccan silk slippers with embroidered crosses in exchange for the black cassock and broad-brimmed hat of a simple priest. His trembling legs descended his private stairway into a courtyard, where a two-horse carriage and a Bavarian count armed with a pistol awaited. After arriving in the fishing village of Mola di Gaeta, some 50 miles from Naples, his mood “lurched between stubborn intransigence born of a feeling of betrayal and an eagerness to regain the affection of his subjects” (138). Chastened and skeptical of democracy, Pius IX turned to his arch-conservative secretary of state, Giacomo Antonelli, the true decision-maker during the 17 months of exile from Rome. “If Pius had no taste of the game of politics, with its strategizing, posturing, and undercutting of rivals,” Kertzer comments, “Antonelli was its master” (126). In the extended narrative that follows, Kertzer brings to life a wide cast of characters who tell the incredible story of 19th-century Europe. It’s regrettable that Kertzer’s description of Pius IX is less detailed in this section, but that’s probably inevitable given the vast scope and complexity of the terrain he covers. Kertzer proves once again that he deserves to be identified among the finest authors of Catholic history, along with the likes of Thomas Cahill, Eamon Duffy, and Dermot Fenlon. When the dust finally settled after Pius IX’s return to Rome in 1850, he was a different man. No longer the “simple, sweet, timid, fearful” country priest, as Victor Hugo once described him, Pius became the pope who would be king. Repression returned at once. The press was censored according to the dictates of the Inquisition, while the clergy’s old immunities and privileges resumed. Dissidents who opposed papal authority were placed with five or six prisoners “in a dark cell intended for one, with no blanket to keep them warm at night, breathing air rancid with the stench that wafted from their lidless latrines. Living on a diet of stale bread and beans, they quickly fell prey to disease” (328–29). His humor now gone, Pius continued as head of the church, promulgating his infamous Syllabus of Errors and calling the First Vatican Council. Through a series of eventful (and ironic) turns, Rome found security in the protection of French troops, but the respite was short lived. When the Franco-Prussian War drew the French military home from Italy, Rome was left unprotected. A new Italian army led by nationalists immediately attacked the Papal States, and Pope Pius IX surrendered. Following a referendum, Rome was declared Italy’s capital city. When it was formally annexed on October 20, 1870, a millennium of Papal State sovereignty came to an end, and Pius IX retreated into a self-imposed Vatican captivity. But even as a new republican capital was proclaimed on the ruins of his temporal power, Pope Pius IX declared the doctrine of papal infallibility—that a pope is preserved from error when solemnly pronouncing teaching on faith and morals as contained in divine revelation. Even as Pius IX was stripped of his political role, he was buttressing his spiritual jurisdiction, beyond the reach of kings, princes, and revolutions. Within this territory, there was one earthly throne and one pontiff with the authority to speak from it. When Victor Emmanuel, the first king of a united Italy, chose Rome as his residence in 1871, the pope was furious. He prohibited Italy’s Catholics from participating in the new political establishment, including elections. This moratorium not only muted the Catholic voice in political and social affairs, it also engendered a strident anti-clerical reaction. It wasn’t until Benito Mussolini concluded the Lateran Treaty in 1929 that the church’s claim on Rome was resolved. Pius IX died in 1878, the longest-reigning pope in history, still defending a European order that was slipping away. This book is for more than Italophiles, students of European history, or those wrestling with the origins of European Kulturkampf. It’s also for anyone seeking to understand how the Roman Catholic Church’s struggle with modernity shaped the theology and place of the church in the liberal democratic West—a process that continues today.